Ontario Fishing Directory - Lures and Tours Blog: Texas Hobie Invitational CBC Podcast Interview! :Ashley Rae! Texas Hobie Invitational CBC Podcast Interview! :Ashley Rae! CBC Ontario Morning interviewed Kayak Angler Ashley Rae following her return from the Second Hobie Fishing World Championship presented by Daiwa held in Austin, Texas, November 4-9, 2012. The competition included top anglers from across the globe who competed for kayak fishing’s most coveted prize. The Second Hobie Fishing World Championship was held on two of Texas’ well known fisheries - Lake Bastrop and Fayette County Reservoir. Ashley was one of only two Canadian Angler who represented Canada at this Invitational. Ashley relates some of the challenges of fishing the two Texas lakes. Hear about 'the one that got away", as well as interesting information about some of the huge catches by International Kayak Anglers. 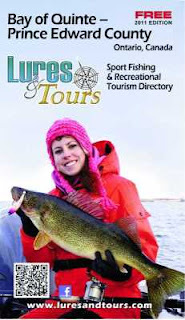 Check out the online LuresAndTours Bay of Quinte - Prince Edward County Directory Featuring Ashley Rae.